1st Law: an object will remain at rest or travelling at a constant speed unless acted on by an unbalanced force. This means that an object will not change its speed or accelerate unless it has unbalanced forces acting on it. How do we work out whether the forces are balanced? Force is a vector and measured in Newtons. It is a push or a pull. It matters which way a force is pushing or pulling on an object. 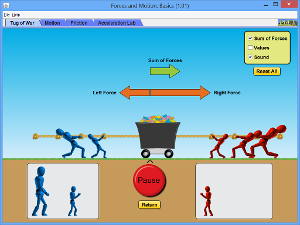 In the tug of war on the left, no one will move if both the blue and red players are tugging with the same force. But , if the red player is pulling with a force of 300N and the blue only 200N, there will be an unbalanced force of 300-200=100N in the direction of the red player. There will be a change of speed, an acceleration. If there is an unbalanced force on an object, it will accelerate, the first law tells us. The second law is putting a value on that acceleration. This means that you need a larger force to accelerate an object with a larger mass. 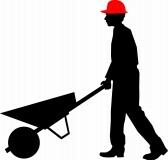 Imagine how much harder it is to push a wheel barrow as you fill it up with bricks: each brick will mean you have to push slightly harder. It also means that if you want to accelerate more quickly, you need a larger force. Imagine trying to get up to a run against your wheelbarrow of bricks rather than a walk. 3rd Law: If object A exerts a force on object B, then object B exerts a force on object A that is equal and opposite or every action has an equal and opposite reaction. So this means that if I lean against the wall with a force, the wall must be pushing back on me with an equal force: otherwise, I'd fall through the wall. The book on the table is pushing down on the table with its weight so the table must be pushing up against it with the same force, otherwise the book would accelerate through the table.